The first major shower of 2016 is the Quadrantids meteor shower. This annual shower has one of the highest predicted hourly rates of all the major showers, and is comparable to the two of the most lively, the August Perseids and the December Geminids. Those living in the northern hemisphere have an opportunity to experience a much better view of the Quadrantids, as the constellation Boötes never makes it above the horizon in the southern hemisphere. This is great for those living in North America, much of Europe, and the majority of Asia. Unfortunately, those of you living in Australia and lower portions of South America will have a difficult time observing the Quadrantids. Observers in higher latitudes will have better gazing conditions, but nevertheless will need to be wary of cloud cover, as conditions are typically cloudy during this time of year. This year, the large and bright Waxing Gibbous Moon (98% full) will coincide with the peak of the Quadrantids meteor shower. This is a stark contrast to the Quadrantids of two years ago, which occurred during a moonless night. While the light of the moon may reduce the quantity of meteors you’ll be able to see, you should still be able to observe all but the faintest meteors. While year will not be ideal for watching this January event, those willing to patiently wait it out in the cold (or warmth, for those in warmer environments) will be treated to the very first major meteor shower of 2016. The constellation Quadrands Muralis was made up of a faint group of stars between the top of Boötes and the handle of the Big Dipper. Quadrands Muralis is now part of the constellation Boötes, thus making Boötes the radiant of the Quadnrantids meteor shower. To find the location of the radiant, we recommend you first find Polaris (a middling-bright star, also known as the North Star) and observe in close proximity to that area. For more specificity, it lies between the end of the handle of the Big Dipper and the four-sided figure of stars marking the head of the constellation Draco. Waxing Gibbous Moon. Quadrantids shower gazing conditions may not be ideal. The moon will obstruct all but the brightest Quadrantids. The Quadrantids meteor shower was first observed in Italy by Antonio Brucalassi during the mid-1820’s on the morning of January 2nd. After this period, several other individuals asserted seeing the “falling stars” during the second day of January. The first re-discovery of the shower occurred in the year 1835, and then again in 1838. By 1839, it was believed that this activity in the sky was annual. The meteor shower formally became known as the Quadrantids due to its proximity to the now extinct constellation named Quadrans Muralis, which was situated near the point meeting the constellations Hercules, Bootes, and Draco. A range of observations of the shower since the year 1864 have revealed that activity generally occurs between December 28 and January 7th. The Quadrantids are particularly fascinating due to their incredibly sharp rise in activity during the 3rd and 4th days of January. During its recorded history, the Quadrantids meteor shower has had observed rates as low as 65 meteors per hour, and as high as 160 per hour. Although much has been revealed about the characteristics of the shower, the Quadrantids has not been consistently studied by observers due to numerous factors. The wintry weather in the Northern latitudes is a deterrent for many, and the shower itself occurs too far north to be plausibly studied by those observing in the Southern Hemisphere. The plant Jupiter plays a major role in the orbit of the Quadrantid meteor shower, and it is believed that the Quadrantids will no longer be visible on Earth by the year 2400. Throughout its history, this has also been one of the most interesting showers to observe due to their ability to produce occasional fireballs (bright meteors) that leave sporadic trails. The first major shower of 2016 is the Quadrantids meteor shower. This annual shower has one of the highest predicted hourly rates of all the major showers, and is comparable to the two of the most lively, the August Perseids and the December Geminids. This celestial event is active from December 28th through January 12th and peaks on the morning of January 4th. In relation to meteor showers, the peak is defined as the moment of maximum activity when the most meteors can be seen by the observer. This year, the Waning Crescent (27% full) will coincide with the peak of the Quadrantids meteor shower. TWhile the light of the moon may reduce the quantity of meteors you’ll be able to see, you should still be able to observe all but the faintest meteors. Those willing to patiently wait it out in the cold (or warmth, for those in warmer environments) will be treated to the very first major meteor shower of 2016. While this wintery spectacle appears to radiate from a constellation, they are actually caused by the Earth passing through the dust particles of the minor planet 2003 EH1. Every January, Earth passes into a trail of dust left by this minor planet, and as a result, all the dust and debris burning up in our atmosphere, produces the spectacle known as the Quadrantids meteor shower, or what are popularly recognized as “shooting stars”. There's no danger to sky watchers, though. The fragile grains disintegrate long before they reach the ground. While the meteors are certainly bright, they are typically not much larger than a grain of sand. However, as they travel at immense speeds, these tiny particles put on an exciting show. During the 3rd of January, shower rates will be a portion of what they could be due to the radiant lying low in the northwestern sky. On average, and under clear skies, observers should see 40 to 60 meteors per hour. However, every so often, these rates can exceed up to 120 meteors per hour in dark-sky locations. In ideal condition—no cloud cover, precipitation, city lights, and no moonlight, the Quadrantids meteor shower should host a spectacular viewing experience! Look for state or city parks or other safe, dark sites. Once you have settled down at your observation spot, face toward the northeastern portion of the heavens. This way you can have the Quadrantid’s radiant within your field of view. If you can see each star of the Little Dipper, your eyes have "dark adapted," and your chosen site is probably dark enough. Under these conditions, you will see plenty of meteors. For many meteor showers it is often recommended to look straight up, but for this year’s Quadrantids we advise that observers face as low as possible toward the horizon without being looking at the ground. In other words, have the bottom of your field of view on the horizon. While you can still catch meteors while looking straight up, you will have an improved opportunity to observe more by looking toward the horizon. Meteors will grab your attention as they streak by! Waning Crescent Moon. 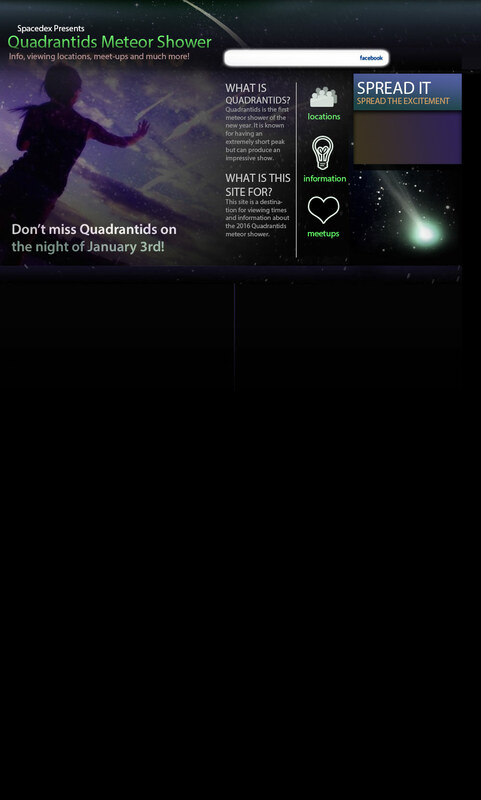 Quadrantids shower gazing conditions will be good. The moon may obstruct some Quadrantids meteors.